Yes, yes, you don't need to tell me - it has been some time since I last posted. One has been quite busy with rail hobby related things Down Under and, as such, my Philippine railway activities have taken a back seat for a while. 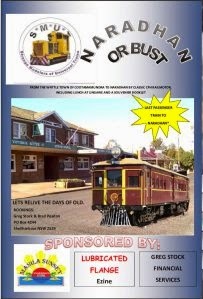 We are trying to set up the ground work for rail tours to help support preservation attempts around Australia. Similar to what we were doing a few years ago for the Philippines - but with the time needed to actually achieve dividends without constant pressure. I've been watching with much amusement the changing railfan scene there in the Philippines and am happy to see a new group of young guys carrying on the passion I once had. Their reports and railway visits are great and I look forward to meeting them one day. To the PNR Train Enthusiasts Fanclub, the PRHS wishes you all the best. On the other hand there is the, not totally unexpected, demise of RIHSPI and another offshoot group in the "Manila Railroad Club' who plan to preserve the little bit that has not been scrapped during the original groups term of existence. The same old secrecy and powers at the helm, well, it does not instill much confidence. Hopefully I am wrong as their plans to restore 906 (and hopefully 902) depend on it. I've been getting some random shots prepared for Flickr and thought I would take the opportunity to stick them up here. There will be a lot more to come. But for now, I hope you harvey very fun time enjoying this random delicious selection of photographic tidbits. Divisoria - the place to head for cheap bargains and rip off DVDs. The now scrapped 7A-2001 believed to be a victim of the Quezon accident is seen here at the Tayuman carriage shed in 2009. Another 7A example in a slightly better condition at Tutuban station. These were a second hand donation from Japan back in the early 2000s. While checking out the situation in the loco shed I was surprised to hear a horn in the distance. A quick sprint revealed 5009 leaving the yard on a perway train for the south. A Pandacan Transportation bus just for something different. Stay tuned for more random helpings.